2015 was the European Year of Development, dedicated by the EU to external action and to Europe’s role in the world. Immigration plays an important role in the development processes; on the other hand, it is linked to issues of sustainability and to the wider context of the cooperation reform carried out in Italy in 2014, which has strengthened the role of the private sector and the immigrants associations in the development of their countries of origin. 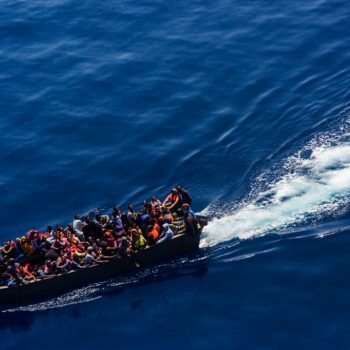 However, these issues, which should have taken priority in 2015, were somehow obscured by the refugee crisis: the most relevant fact is, obviously, the development of Juncker’s agenda on immigration with a focus on the fight against human trafficking, the relocation of migrants across countries and the support to frontier states. There are 34 million foreigners in the European Union, equivalent to 6.7 percent of the total population. The countries with the most foreigners are Germany, UK and Italy, while some smaller countries like Switzerland have even higher percentages, although mostly from immigrants born in adjacent European countries. Obviously, the definition of foreigner does not apply only to people from other continents or non-EU countries, but also to migrants within the EU itself: Romanians in Italy are European citizens, but somehow we see them as foreigners in regards to Italian citizenship. When we analyse the percentages of foreigners we see that the net migratory rate – the difference between immigrants and emigrants of a given area in a period of time – is positive in northern European countries, where the employment rates are rather high (the immigrant employment rate is near 63 percent in Germany, near 70 percent in UK). One notices, by contrast, how Italy has much lower rates, yet still higher than those found in Spain and Greece. Overall, Italy maintains a positive net migration rate, however determined mostly by family reunifications. Our country is still attracting enough immigrants, but they are predominantly relatives of people already working in Italy; in other words, there are not many who come to seek employment in Italy at present, except for a natural employee turnover. Obviously, this is also a good sign, meaning that those who arrived in Italy and found employment have decided to settle down and make their presence permanent. Looking at demographic trends, foreigners in Italy in 2005 accounted for 3.6 percent of the total population. Today they comprise 8.2 percent of the population, which we know is above the EU average of 6.7 percent. In Italy, we have nearly 5 million foreign-born residents. Obviously, we are not referring only to immigrants from poorer countries or fleeing wars, but to all migratory phenomena on all routes. ISTAT’s forecasts tell us that this percentage is going to rise: it is expected to reach at least 13% in the next ten years. What we can say with certainty is that the median age of foreigners is lower: one out of ten Italians is at least 75 years old, compared to one out of a hundred foreigners. 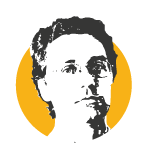 Therefore, they have a lesser impact on pension costs and other welfare expenditures. It is safe to say that we have at present a relevant participation of foreigners to the workforce, who are effectively contributing to the pensions system. Overall, we can say that immigrants today have helped a lot of firms stay in business that would have otherwise gone out of business. This is a fact: without the immigrants, we would now be a few hundreds of thousands businesses short. For that, we also have to thank their greater capacity for enduring sacrifices, which we certainly should not abuse. To be more specific in regards to individual sector estimates, the contribution of foreigners to the production of wealth in Italy is currently about 125 billion euros: the share of GDP that is attributable to immigrants in an employed or self-employed capacity. This is about 8.6 percent of the total added value, which is roughly the same percentage of immigrants in the total population. The percentage is higher in the catering and construction industries, where it reaches 17-18. Then we should not neglect to mention sectors like family care services – the so-called “badanti”, or caregivers – that provide an essential (and probably invaluable) contribution to certain services that would be otherwise infinitely more expensive or disadvantageous. On a total 5 million foreign residents, 3.460.000 are taxpayers: they contribute to the State’s expenditures and social insurances and in 2014, they declared taxable income for 45.5 billion euros, and paid net income taxes (Irpef) for 6.8 billion euros. 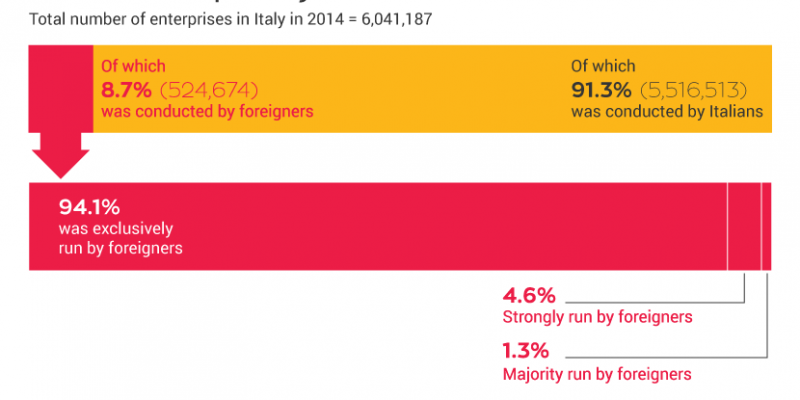 The proportion is slightly lower than that of Italian taxpayers, because of the progressive nature of Irpef – lower-wage workers get to pay lower average rates: the median income of foreign-born workers is much lower than for Italians: 13.000 euros versus 20.000, that is, a 7.000 euro yearly differential. Even so, a conclusion can be drawn: if we want foreign workers to pay our pensions, they must be paid decently; otherwise, we will lack the necessary social security contributions. Then there are more than half a million businesses run by foreigners – 524.000 in 2014, generating more than 6.5 percent of the total added value: nearly 95 billion euros. This translates to a significant number (632.000) of entrepreneurs, people with entrepreneurial roles or who sit on the boards of corporations. 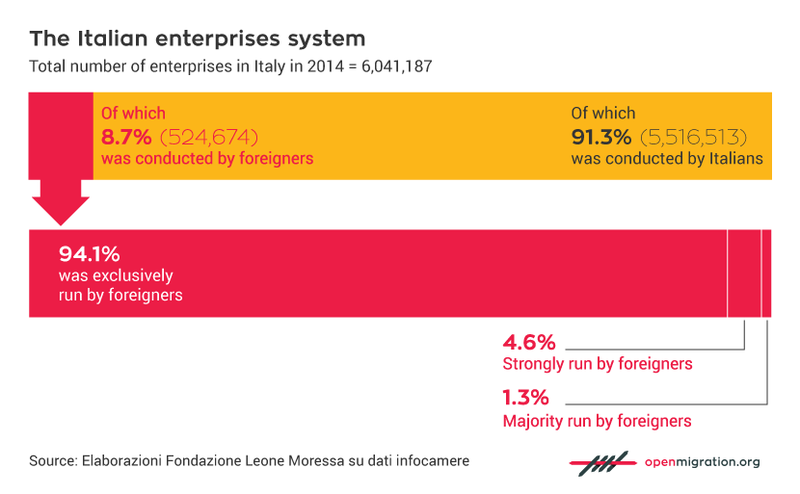 Foreign entrepreneurship is therefore a relevant phenomenon, especially given the declining trend for Italian entrepreneurs (nearly -7 percent over the last five years) and the 23 percent increase in foreign entrepreneurs. If one looks at Italy’s public expenditure, one notices that it is absorbed primarily by the Italian population: the immigrant population is an overwhelmingly young one, therefore the State’s revenues from people born abroad is about 16.5 billion and the expenditure is about 12.6 billion. This means that there is actually a nearly 4 billion cash balance, so right now our public finances are benefiting from the situation. It is also clear that, from a citizen’s perspective, if there wasn’t a certain number of foreigners in my town we would have had to fire a few doctors, close a few more hospital wards and hire fewer teachers in schools.